Something rather odd happened the other day. I was walking down a busy Oxford street, the bright sun shining down on my head when I heard God speak to me. Not in the way I feel I've heard before through others, through books, through songs - no this time I actually heard him speak. It was a little disconcerting to say the least and I did wonder if I had in fact gone mad or just imagined the whole thing, but then I remembered I believe in a God who moves mountains, creates rainbows and sacrificed himself so we can all live and so actually him talking to me first thing on a Monday morning wasn't really that big of a deal. And yet just in that moment it was exactly what I needed to hear. But for you to understand I will have to go back a little and give a bit of a life update so bare with me whilst I explain. For those of you who don't know, after a long struggle I left university in November (you can read about that here) and decided I was going to follow my dream of becoming a writer. I decided to get myself a part time job earning enough money so that I could afford to live and spend every spare moment I could find to write. However after multiple job interviews, job offers and one false start I was left with a job working 40 hours a week, standing on my feet all day and absolutely no time or energy to do anything more than stick the tv on when I got home from work. I loved working with the girls in my team and I would have a lot of fun during the day but as it became increasingly obvious that I wouldn't have the time to dedicate to the things I actually wanted to do i started to get a little bit restless. All along I had been saying to myself that 2016 was going to be the year I tried to achieve my dreams and if I failed at least I tried but here I was getting comfortable in a job and to be honest just giving up. And so I started to pray. I asked God for a way out, I asked him to lead and to guide me, I asked him if he wanted me to stay in my job or to be a writer, I asked him if this dream in my head was something he wanted or something I wanted. I prayed so hard for weeks, I felt lost and confused but I kept on praying. I am a great believer that pray is powerful but I also believe that you can't just sit around waiting for God to drop it in your lap you have to get up and push some doors and pray he will open the right one. And so as well as praying I started to push a few doors. I applied for multiple part time jobs, I tried to get a part time position at my current work and I went to job interviews. But despite all these efforts nothing came back, every door I pushed was closed. And so I started to get angry and frustrated and I prayed harder asking him if he wanted me to stay in my job that he bring me joy there. But still I was left feeling unhappy and unsatisfied, I wasn't doing what I had left university to do and instead I had just gotten myself into another trap. Why couldn't I get another job? Why were the doors not opening? I thought about it constantly until finally one day I sat down with my fiancé and we looked at my accounts. I wanted to see if I could leave my job without having another job to go to. I had been saving and paying off my rent earlier than I was supposed to and I knew soon the only things left to pay for would be my food and living costs. After a few calculations and carefully thinking I realised I had enough money to live off until the beginning of September. Although this was becoming a serious viable option I knew it was a dangerous one. What if I ran out of money? What if something major happened and I needed more money than I thought I did? And so I continued to apply for part time jobs but again I got nothing back, the door was always closed. But I started to feel God speak to me through different things, the book I was reading, the bible verse I was looking at or a talk on Sunday. He seemed to be saying you can sit where you are at the edge of the cliff comfortable but always wondering what is on the other side or you can jump and let me catch you. And so I decided to hand my notice in without having another job to go to. I jumped but there was the possibility of a part time job at my current work coming available later in the month and I still had an interview in a few weeks so I didn't feel particularly worried but it was still quite scary. My first day without a job I had an interview in a shop I loved, working 1-2 days a week with possible over time when people were on holidays. It was exactly what I was looking for. I would have time to write and try to make money that way but I would still have a safety net. I sat down to the interview feeling very confident that this was a door God would open and the first thing the interviewer said was "we need a Sunday girl" and I knew I couldn't do it. I left the interview feeling disheartened, worried and scared. What was going on? Had God not spoken to me at all? Was I making a huge mistake? Should I run back to my old work and beg for my job back? And thats when I heard him speak to me "Trust me my love" he said. At first I thought I was just imagining it but then it repeated itself in my head and was soon followed by a verse from proverbs "do not lean on your own understand". As I sat down to wait for the bus those words were ringing through my ears and I realised I needed to stop. I said I wanted to make this dream a reality with God at the centre and that was what I needed to do. I had to stop worrying and stressing and instead just follow this dream wherever it might lead me because God will always provide and look after those that are faithful to him and so I said "Okay, I trust you". There was no massive clatter of thunder or a streak of lightening across the sky following that decision but God carried on talking to me. As soon as I made that decision I got a text from my fiancé to say he had finally got himself a summer job after dropping his CV off with the manager. She hadn't even interviewed him just given him the job straight away. I was then invited to my first event as an Oxfordshire blogger which I am super excited for and all the little things I had been worried about started to sort themselves out. I still don't know what will happen at the end of summer, I am hoping to be published in one way or another and able to make some kind of money from my writing so I can survive but I'm praying about it. I trust that God has got this. 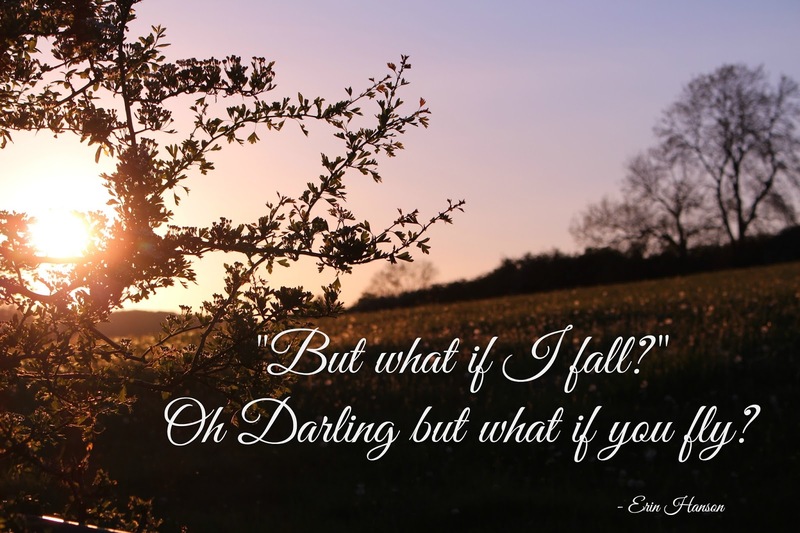 Its the biggest step of faith I think I have ever taken and quite hard for some one with anxiety but I trust he will take care of us and so I am living day to day, writing, blogging, reading, baking and creating the slow, calming life I want to live. Ive given it all up to God and I know that in the end he will always be there to catch me if I fall but at the moment he wants me to try to fly.